ESMO, Munich · 2018, S. Bonvalot et al. NBTXR3 is a first-in-class Hafnium-Oxide nanoparticle intratumorally (IT) injected. When activated by radiotherapy (RT), it allows for a higher energy deposit than RT alone, yielding an increased tumoral cell death. 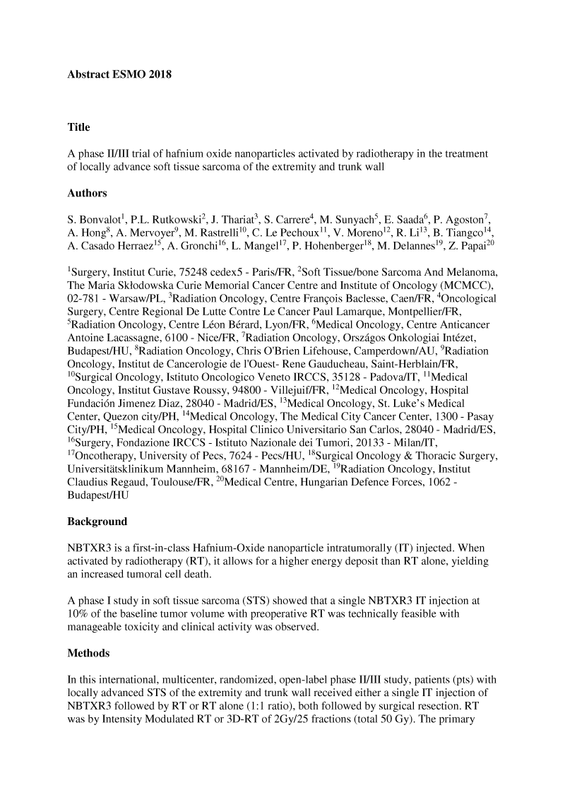 A phase I study in soft tissue sarcoma (STS) showed that a single NBTXR3 IT injection at 10% of the baseline tumor volume with preoperative RT was technically feasible with manageable toxicity and clinical activity was observed. In this international, multicenter, randomized, open-label phase II/III study, patients (pts) with locally advanced STS of the extremity and trunk wall received either a single IT injection of NBTXR3 followed by RT or RT alone (1:1 ratio), both followed by surgical resection. RT was by Intensity Modulated RT or 3D-RT of 2Gy/25 fractions (total 50 Gy). The primary endpoint was the pathological Complete Response Rate (pCRR) defined as the percentage of pts presenting ≤5% of residual viable cancer cells (EORTC guidelines) evaluated by a blind Central Review Board. Key secondary endpoints included negative surgical margins (R0) and safety. In the intent-to-treat full analysis set population (n=179), which included all pts who were randomized and stratified by STS histological subtype, the pCRR was 16.1% vs 7.9 (p=0.0448) and the R0 rate was 77.0% vs 64.0% (p=0.0424) for NBTXR3+RT and RT alone respectively. NBTXR3 caused injection-site pain in 12 (13.5%) pts. It was also associated with grade 3-4 acute immune reactions in 7 (7.9%) pts, but these adverse events were of short duration, manageable, and resolved spontaneously in some cases. Outside the injection, NBTXR3 was very well tolerated and its safety profile was comparable to RT alone. NBTXR3 activated by RT was signicantly superior to RT alone and this trial met both primary and secondary endpoint with a positive safety profile. NBTXR3 represents a new option for preoperative treatment for locally advanced STS.